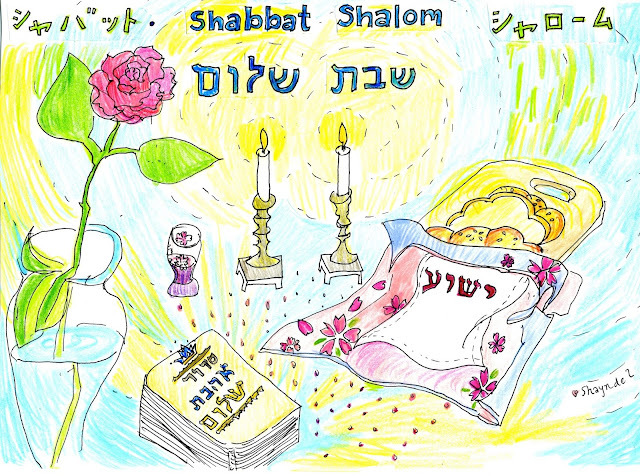 Challah and Cherry Blossoms: Daily Bread Postcard---Shabbat Shalom! Somehow what I wanted to express in this post-card was about how when I looked at the table and drew all the things on on it, I was struck by how everything in the Shabbat observance points to Yeshua. In the drawing, the Hebrew letters covering the challah spell Yeshua. All things were made through Him. He was with God in the beginning, so too the Shabbat was made through Him. May we be imitators of Messiah Yeshua, walk as He walked, rest as He rested, heal how He healed, love as He loves!! Please LORD, teach us how to do all that, and may we be patient along the way as we learn what it means to do so!! May You touch the heart of someone who is reading this , may Your presence be known to her, and may Your love and divine healing reach her. May Your Light search deep into our hearts this Shabbat and dissolve our dark places and as we rest in You. All Glory to God, Hashem Yeshua, Amen!! Amen! Thank you for sharing Cindy, I love how you expressed that, so beautiful. Hugs and blessings and a great day to you!